This is my daughter Andrea Gwen and a friend she named Freckles. 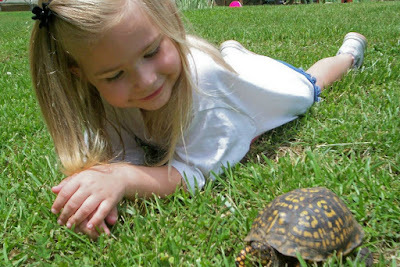 She met this shy box turtle several years ago, passing through our backyard. She loves all kinds of critters. Click on Above Image To Listen To Passages From The Bible, Read By Max McLean. A Great Way To Start and/or End Your Day! Welcome to my blog! My name is Dana. I am a mother of three daughters Alisha, Ashley, Andrea (pictured above). I have two wonderful grandaughters, Savannah and Kylee. I love spending time with my family. Food is a wonderful way to bring family together and create happy, lasting, family memories. When I take the time to cook for them, I hope it makes them feel special and loved. Searching for new recipes is like a treasure hunt for me. I just never know what I'm going to find next. Enjoy your visit! When you purchase Sweet Hope Cookies, 100% goes to the ALS Association. Visit *Dana*'s profile on Pinterest. AMERICA SAYS GOODBYE TO BERNARD CLAYTON, JR.